FREE UK/ROI & EU Lifetime Map updates worth over £100! 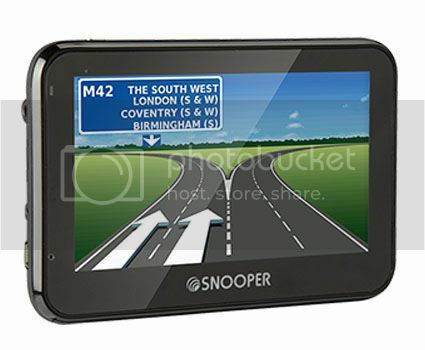 NEW Snooper Syrius Pro S2700 portable car sat nav and speed trap detection system with FREE Lifetime Map Updates! Super slim with a full colour 4.3" widescreen LCD, Junction view, FREE TMC, Snooper's award winning speed trap location database plus much more. Full featured and affordable! Multi-route Pro software now puts up to 16 destinations in the Fastest, most Efficient order! With our Pre-Loaded Mapping - Simply Plug & Go, Simple Installation Free. S2700 SYRIUS PRO - What's new? S2700 Syrius Pro includes a completely new and updated menu design, making it easier to find the functions you require. Brighter, stylish and easier to use. To ensure that you always have the very latest Syrius Pro software and street level mapping available, S2700 Syrius Pro comes with FREE Lifetime Map Updates as standard. Simply register your unit online after purchase and receive free map updates for the life of your unit. Instructions for online registration are enclosed. Latest street level mapping supplied by Here® Maps for Life. Ensuring all new units have the very latest in street level mapping provided by Here® Maps for Life, we offer a map guarantee for the first 30 days after initial GPS connection. Full screen images of main motorway junctions are displayed in advance to help you navigate more safely. Specially formulated lane guidance software provides advanced notice of which lane or lanes to use when approaching junctions for safer driving. The new Snooper S2700 not only includes our award winning Aura speed trap database* but additionally includes a new feature, My Speed XL. Whilst travelling routes you're already familiar with, My Speed XL software will display the speed limit of the road you're travelling, plus your current speed in large format. This aids drivers to quickly see the speed limit and their current speed, protecting their driving licence and keeping them free from hefty fines. Search and navigate to motorway junction numbers using the updated 'Find by map' function including Junction numbers. Create and save your own bespoke routes. Use the map view to select the roads you would like to travel on or search road by road. Use 'Your route' to build your own personal, tailored routes. Choose to search from our extensive list of Point's of Interest using our new 'corridor' search facility. The 'corridor' search function enables you to search specifically along your pre-programmed route. Increase the size that road names and numbers are displayed on screen making them easier to read for safer and easier navigation. THE IMPORTANCE OF VERIFICATION - ALL DATABASES ARE NOT CREATED EQUAL. Unlike AURA, many other GPS speed camera databases rely largely on locations provided by hobbyists who might not be able to tell a speed camera or a red light camera from a traffic flow camera or a surveillance camera. These databases could result in annoying false alerts, which could lead you to start ignoring even legitimate alerts-defeating the point of having a GPS database in the first place. Other databases are not updated every day, and they also limit how often you can download updates. As a result, devices using these databases are not as up-to-date as they could be and are likely to miss alerts. In contrast, Snooper has assembled a professional team that devotes every working day to verifying each and every speed camera and high risk zone that goes into the AURA database. The AURA database is constantly updated, and can be accessed 24 hours a day, 7 days a week. AURA's reliability is backed up by Snooper, one of the most respected and trusted satellite navigation and speed camera location manufacturers. Snooper has won dozens of awards for innovation and product performance and has been establised since 1979. If you're considering a GPS database to reduce your risk of an unintended speeding ticket or accident, doesn't it make sense to go with the database and the company that reduces that risk the most? As well as the UK and Ireland, the AURA speed trap database now offers Worldwide protection Including Germany, Holland, Belgium, France, Spain, Portugal, Switzerland, Italy, Austria, Luxembourg, Denmark, Norway, Sweden, Finland, Poland, Romania, Russia, North America, Canada, Australia, New Zealand and South Africa and is still growing. Premium TMC (Traffic Management Content) Traffic information technology - FREE of charge! If you're an experience driver you will know the importance of needing to know exactly what lies ahead. Accurate and reliable information is a must to ensure that you arrive on time. Traffic information is fed from 100's of thousands of vehicles and sensors across the country providing up to the second information. Snooper's Pro TMC service will alert you to traffic incidents across the country. If there is congestion on your route simply ask your satellite navigation unit to find a route around it. A satellite navigation system is only as good as its mapping software - this is why Syrius S2700 utilises Here® Maps for Life street level mapping, ensuring that you can travel from A to B using the best route possible and more importantly, without getting you lost. By using Here® Maps for Life digital map data, Syrius S2700 is able to offer accurancy, detail, reliability, and flexibility providing you with a highly accurate representation of the detailed road network. It is the unseen force behind the leading express mail services, emergency and government routing plans, efficient field service management, as well as numerous fleet operations, worldwide. Snooper sat nav systems have always been the most stylish available. But they don't only look good, they deliver a performance to match.Take our new and unique Multi-route planning software. Multi-route allows you to calculate a single route around up to 16 different destinations just by adding the postcodes. No stopping and starting, struggling to find each and every address, simply your full day's travel calculated and saved in just a few seconds. Going off the beaten track? All you need is the geographical co-ordinates and your Snooper satellite navigation system will take you straight there. The Snooper Syrius S2700 Pro comes with the latest street level mapping supplied by Here® Maps for Life. UK & Ireland and Extended European mapping packages are now available as below details. Comprehensive data comes as standard with full street level mapping and points of interest. UK, Ireland, France, Spain, Portugal, Italy, Austria, Switzerland, Belgium, Holland, Luxembourg, Germany, Denmark, Norway, Sweden, Finland, Poland, Estonia, Lithuania, Czech Republic, Latvia, Liechtenstein, Hungary, Romania, Slovakia, Slovenia, Serbia, Montenegro, Croatia, Turkey, Greece, Albania, Bosnia & Herzegovina, Bulgaria, F.Yugoslavia Rep.of Macedonia, Russia, Cyprus, Ukraine, Belarus. There is no need to set the detection range of Syrius S2700, as it automatically calculates the distance required depending on the speed limit. For instance it will alert you 200 meters in advance in a 30mph zone and up to 500 meters in a 70mph zone. With our Pre-Loaded Mapping - Simply Plug + Go, Simple Installation Free. Syrius S2700 comes complete with a neat windscreen mounting kit and in-car power lead. It requires no installation and can easily be moved from vehicle to vehicle in a matter of seconds if required. Payment can be made by credit or debit card during online registration or by telephone. Details of these options are available in the quick start guide supplied. All three options provide unlimited access to the AURA Worldwide speed trap database! To update the AURA speed camera database on your unit you will need a PC with either Windows XP, Windows Vista, Windows 7 , Windows 8 or Windows 10 and have internet access. LCD Display Display size: 4.3"
Operating Temperature range. -10°C.~ +60°C. Storage Temperature range. -20°C.~ +70°C. Atmospheric pressure. 860MBar . 1060Mbar. This unit has been designed to provide safe and efficient routing but it is not a substitute for driving with due care and attention. The driver is responsible for paying full attention to road signs, road conditions and the proper operation of the vehicle at all times. Always defer to all posted road signs and road conditions. *Please note Snooper S2500 SYRIUS PRO is supplied complete and ready to use with all thats required supplied in the box.The above items are optional extras.